The Burbank 8×8 Pro Commander L Screen has been designed to flip for left or right handed pitching. 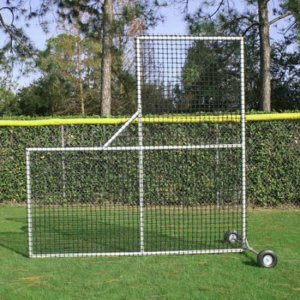 The 8×8 Pro Commander L Screen has been designed to flip for left or right handed pitching. With the hip saver and interior support, the Pro Commander Screen provides the ultimate protection for the thrower during BP. By having no front peg it eliminates divots in your grass! Pro wheels allow easy maneuverability on and off the field. It is available with different netting options along with all welded aluminum or galvanized steel construction. All Burbank frames are made here in the USA at our facility by an experienced welder. No front peg, which eliminates divots in grass!